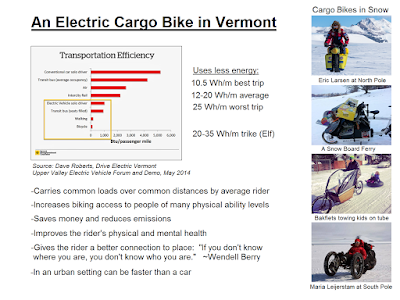 Three months ago I put together a general introduction to my bikes for Drive Electric Vermont, the state agency responsible for implementing electric vehicle infrastructure and getting EV info out to people. It was an overall view, with just a small amount of tech details to help people put the ideas into context. Last month I repeated it for the Norman Williams public library in Woodstock, so I've decided to post a written version here for people to refer to. These slides have a lot of info (you can click on them to expand them for reading), but I've added captions to help explain them. Around 2010 I decided that I seriously wanted to use my car less, and in my rural area a bike seemed like the best alternative. However I needed to cover distance while carrying loads, there are many hills, and I am only in average physical shape. 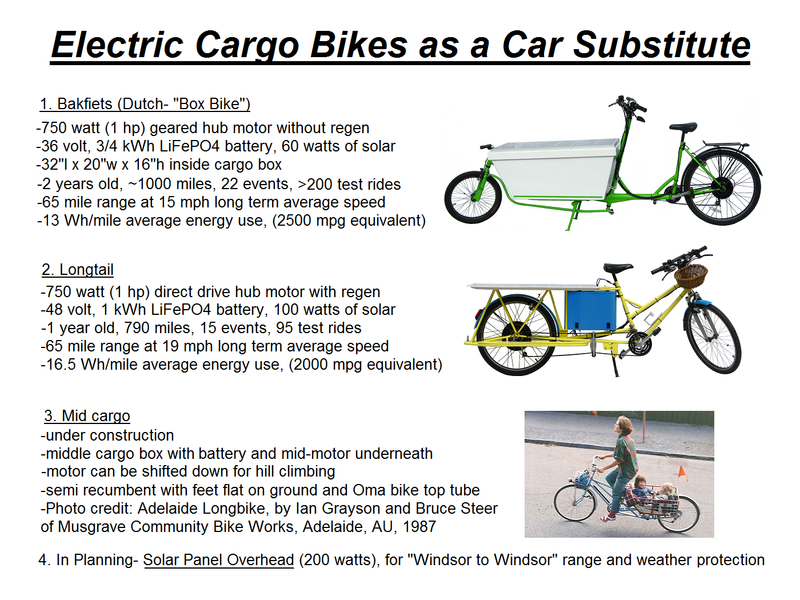 I built the first two solar electric cargo bikes shown above, and it became a large experiment that I shared with people around me as I participated in my town energy committee and Sierra Club activities. Building is relatively easy for me as I've been doing it all my life- I grew up on an apple orchard and when I was nine I put a lawn mower engine on my sister's bike using scrap equipment parts. Fortunately electric drives have become very good since then. The first two bikes have worked quite well, and since the presentation 3 months ago have traveled several hundred miles and a few dozen test rides more than shown in the slide above. I'm now building a third bike with a mid cargo box and mid motor, which should arrange the motor and battery layout nicely. It will also be able to shift down for hill climbing, and it will have a lower seating position. A fourth bike is being planned with more bodywork for both weather protection and fitting more solar power. This slide shows some examples of electric cargo bikes in use. My Longtail is shown in the upper left with a 92 pound load, that I rode 11 miles to home using 4 cents worth of electricity. I've also often ridden 45 to 50 miles (round trip) in street clothes to meetings on it without sweating. In the upper center, the German utility company E.ON has a fleet of 6 eBikes for use, and they came out with a couple of Bakfiets with solar panels on the top a month or two after mine, so I like to joke that they copied me. 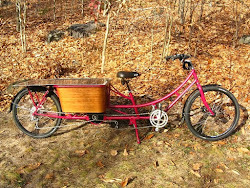 Upper right- I loaned the Bakfiets to the Bellows Falls Community Bike Project for a couple weeks last summer, and Bonnie took a day trip picking blueberries and visiting local farms, she simply put a large foam cooler inside the cargo box for keeping the food cool. 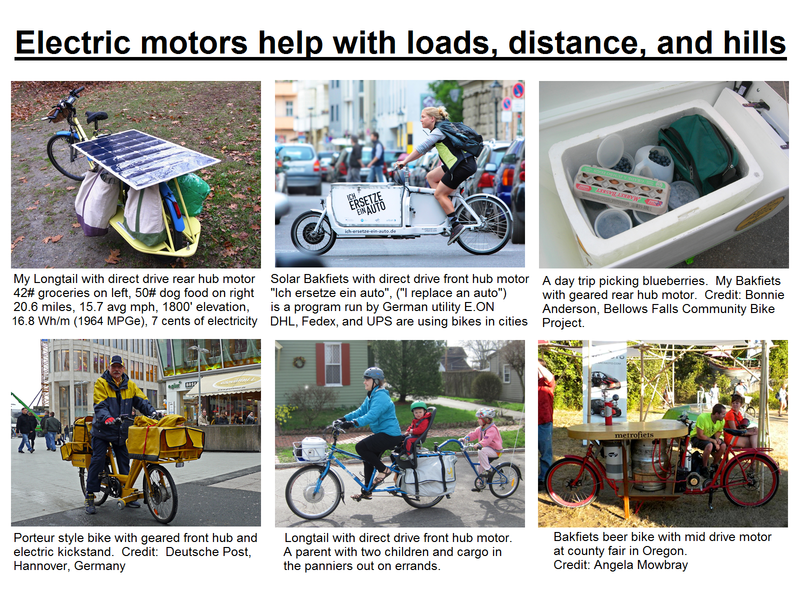 The lower left shows a mailman for the German postal service- they have several versions of eBikes. UPS, Fedex, and DHL also all have cargo trikes for delivery in urban European locations, which are often faster than a delivery van driving through traffic. In the lower middle is a family with kid's stuff in the pannier bags, and lower right is a vending bike for a craft beer company. The rider on the E.ON Bakfiets is probably in good condition, but for all the rest of the riders the electric assist makes the difference between using a bike to carry heavy loads or not. The table across the top of this slide shows the basic types of motors. From left to right- my Longtail has a direct drive hub motor (the motor case is the wheel hub), which is best suited for faster speeds and can regenerate electricity for recharging the battery when braking. My Bakfiets has a geared hub, (with a smaller motor inside the hub that spins fast and uses gears to slow down the speed to connect to the wheel), which is slightly better (10% - 20%) for hill climbing than the direct drive hub, but can not do regeneration because of the slip clutch necessary for the gears. All in one or add on wheels like the Flykly and Copenhagen wheel are geared hubs, and in general are weaker versions because the motor and batteries are all packed in the hub so they have to be smaller. Their motor strength and heat dissipation will most likely be a problem on hills in my area, the all in one hubs are better suited for commuter runs in flatter terrain. The last type of motor is connected to the chain, not the wheel, and this allows down shifting the bike for climbing hills, as well as getting by with a smaller motor (many European countries have a 250W motor limit). It also allows fitting outrageously big motors for racing, but these usually have to be connected to the rear wheel with a separate left side chain, because the standard bicycle chain and derailleurs can handle only 500W to 1000W before they start to wear out quickly. Having said that direct drive hubs are better for speed and geared hubs are better for hill climbing, I'll contradict that by saying I've ridden my longtail with direct drive up Mt Washington- but it wasn't easy! (left lower picture). A direct drive was also the fastest bike up Pikes Peak a year ago In this instance they dumped a lot of energy through the motor, and since the motor case is the hub it could dissipate the heat and not burn up, which is more of a problem with a geared hub motor that is sealed inside the hub. 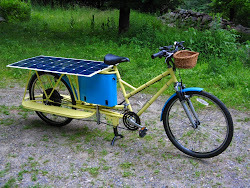 The solar panel output on the bikes varies widely depending on weather, trees along the route, how long I park in sunny parking lots while stopped, etc, but it has generally been running from 25% to 40% of the energy needed during a trip. In contrast I've been getting 1% to 6% back from regen. I also sometimes leave the bike out in the driveway for the rest of the day when I get home, and find the battery is often fully charged when I bring it in. The lower right photo is around the fourth version of Luke "Live for Physics" "Death Bike", which can run through a standing start quarter mile in 11.5 seconds at 110.6 mph. Speed is not a problem for an eBike, but there is a trade off between speed and range. Luke's bike is fast, but probably cannot travel more than a mile or two at speed. This is a mid motor setup, and has the separate chain for connecting the motor to the rear wheel. A mid motor can allow special gearing, unusual motor sizes (Luke is probably feeding 100 kW through this motor for a few seconds), and better cooling than a hub. The name "Death Bike" is from the earlier versions, which had a tendency to launch unwary riders air born. The rider in the photo is actually Stephane Melancon, who rode his electric motorcycle from Montreal to Mt Washington, where I had the chance to talk with him a bit. 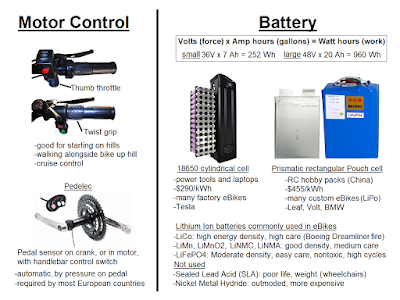 On the left in this slide are the two types of controls used on eBikes. Some bikes use a hand control such as a thumb switch or grip that twists to turn on the motor, others are connected to pedal switches, known as Pedelec systems. The Pedelec comes in two varieties- a sensor that looks for rotation of the pedals (cadence or motion sensor), or a sensor that monitors the pressure on the pedals. I slightly prefer the hand control because it makes starting with a load much easier to balance, but the Pedelec is legally required by most European countries. The pedelec pressure system is almost as good as a hand control, but the rotation sensor method often takes one half to two pedal rotations before it will turn on. On the right of this slide- often times dealers will list a battery as "7 Amp hours", but Ah isn't the whole story for battery capacity. You are looking for Watt hours when comparing systems, which is Amp hours times the battery Voltage. For current eBikes a small battery is around 7 Ah x 36 V = 252 Wh, or about 1/4 of a kiloWatt hour (the same unit as on your home electric bill). A large battery might be 20 Ah x 48 V = 960 Wh, or about one kWh. Batteries are made of many smaller cells, with the round 18650 cell (18 mm diameter by 65 mm long) being more common because they are made by the billions for laptops and power tools, and are less expensive ($290 per kWh average price in 2014). I'm using the flat pouch prismatic (rectangular form) cells in my bikes because they pack better, I'm not concerned about cooling because the battery is oversized (to allow me long distance riding), and the safer LiFePO4 chemistry that I like is common in pouch cells. However each time I've ordered a battery (from China), it's been about $475 per kWh, and it disappears into China post for about 15 weeks and then shows up looking like the box was rolled and crushed, The batteries have worked fine, but if Tesla makes their cells from the new Nevada factory available to builders like me, I'd gladly switch to paying $185 per kWh less and a 2 week delivery. Our culture is built around the car, and our highway budgets are mostly car dollars. Besides the general public test rides and talks I've been giving, I think it's important to reach out to planners and government people also. Dave Cohen in Brattleboro has been trying to build a fleet of Cargo eBikes that can be loaned out to energy committees and bike shops around the state, (see www.vbikesolutions.org), but establishing the need for them, planning for biking systems, and funding are the usual problems. To prepare for this my Longtail is currently (June 2015) up in Montpelier in a 30 day pilot study for the VT AOT program Go!Vermont. 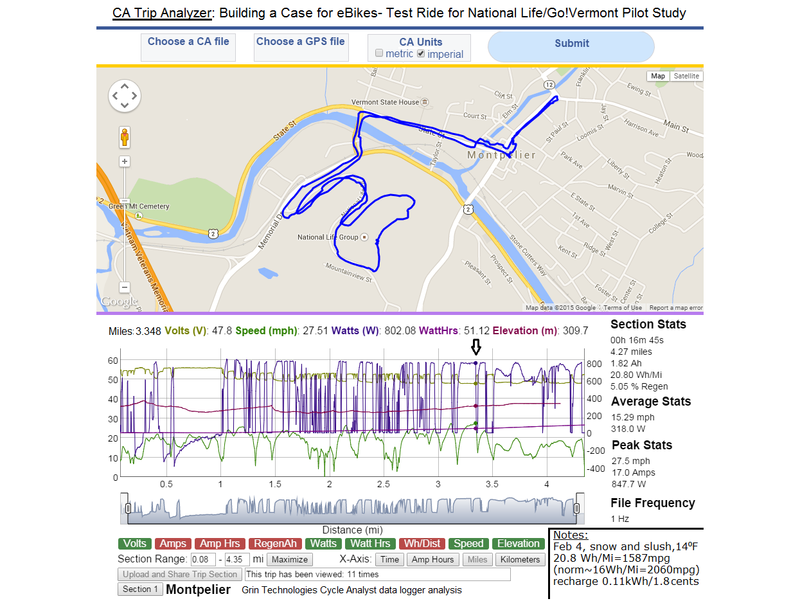 This slide is a screenshot of data from a test ride I took through the capitol on February 4 for the study, (during very bad weather with 3" of snow on the road- the bike was a slush ball at the end). 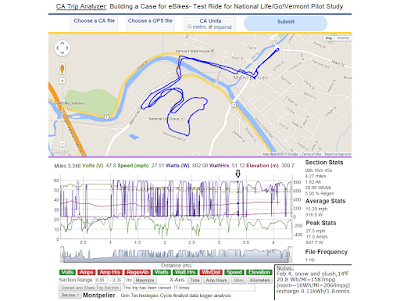 My bikes have Cycle Analyst data recorders that measure electrical use and GPS location so that it can be analyzed. You can see the trip was 4.27 miles and took 16 minutes and 45 seconds, or basically just like a car. It had an unusually high energy consumption of 20.8 Watt hours (Wh) per mile, (which I think was primarily due to the snow and slush, and second to the temperature of 14 F), which gives a total of 89 Wh (or 1.5 cents) of electricity for the trip. (Using a plug in charger that is 85% efficient instead of the built in solar panel, the electricity needed is about 110 Wh, or 1.8 cents.) I've positioned the cursor at one of the peak speeds on the graph for reading the other selected measurements at that moment. You can see that my average speed was 15.29 mph, and peak was 27.5 mph. I've found 99% of Vermont drivers to be considerate of me on the road, with some of them going way out of their way to give me space on the road. (I think this is because after a few winters here, you learn that if you think of the road as a race track you can get in big trouble.) However the way our roads were built was meant for cars, and it is hard to create new traffic flow habits. In all the major cities in Vermont I've found it easier to ride in the car lane at the 25 mph speed limit, then to try to ride slower next to parked cars and causing a traffic block. Burlington is a special case because they have installed some bike lanes, and using them (even going uphill) I found biking to be faster than the cars. Despite these results, the general reaction by a car driver to my bike is to try to pass. (One example that stands out was a pathetic small sedan in Brattleboro going uphill, the driver was flogging the car for all it was worth.) Rutland also tried to install bike lanes along Route 4 going east, but the merchant push back grew into a nasty political battle and they had to be removed, despite several studies that have shown increased business volume resulting from bike lanes. -Training- riders and drivers need to know their space on the road and how to act, as it is a public commons. -We really need to spend more dollars on bike (and pedestrian) infrastructure and less on cars, such as wider road shoulders in rural areas, and Intermodal transportation systems that can carry bikes easily. -Appropriate speed, since just like cars, bikes can travel too fast and get in trouble. -Critical mass is when enough bikes are on the road that they are common and drivers expect them. -Riders should stay aware, since riding a bike is so much fun that it is easy to get blissed out. 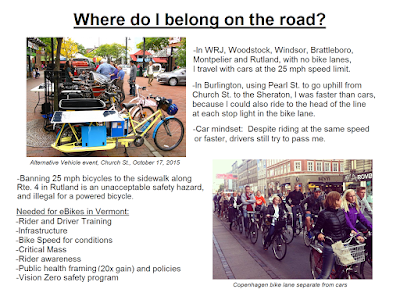 -Other programs- two of the main supporters of the Complete Streets legislation during it's passage into VT law a few years ago were AARP and parts of the VT Department of Health, but not so much transportation people. There are known health benefits to biking and walking- it has been shown that the benefit of biking to a person's health is about 20 times greater than the risk. These benefits should be promoted, as well as programs that enable people to bike or walk. -Vision Zero is a program that started in Sweden, and has been taken up by NYC and California. It is about using the design of roads to prevent accidents, with the goal that no one should get hurt just from traveling from point A to point B. Since eBikes can be built to travel at motorcycle speeds, it's necessary to artificially set the maximum speed. Some of the guidelines I'm using to build my bikes are shown in this slide. For context I would like to point out that in real life it is difficult to enforce these rules, not just because many bikes lack speedometers, but also because regular bikes are capable of 25 to 30 mph with only human power (the human powered bike record is 83 mph), and I've reached 46 mph coasting downhill (with no motor power) on both of my bikes. 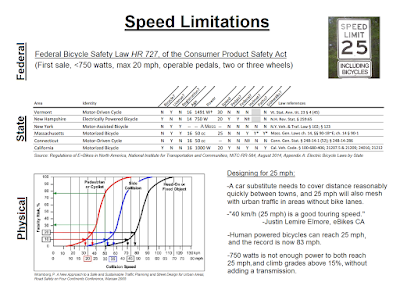 The most universal rule is the Federal limit of 20 mph under test conditions, but it is a Consumer Product Safety Act, and applies only to the first sale, i.e. from a manufacturer to first purchaser. The state laws are a little more explicit, with a maximum speed around 20 to 30 mph, but some details such as motor only, or motor and pedaling together, are often missing. Sometimes the vehicle classification is vague too, for example the NYC bike messengers did such a bad job of using electric bikes that they got them banned (although vendors and delivery bikes still seem to be using them), and this spilled over to a legal quandary for the rest of the state that needs an act of the legislature to assign a vehicle category to eBikes. Vermont is generous with a 30 mph and 2 HP limit, but it is my guess that this law is from the 1960's when putting a small 2 cycle gas engine on your bike was popular. Some interpretations of VT law use this rule to find that a license is required, others treat eBikes as bikes and it is not. My bikes are set up for the Federal 20 mph under motor power only rule, but they do not turn the motor off when pedaling above that speed (such as California requires). I think this is a good compromise, because I can fairly easily reach 25 mph to make it practical to travel between towns, or flow with downtown traffic. 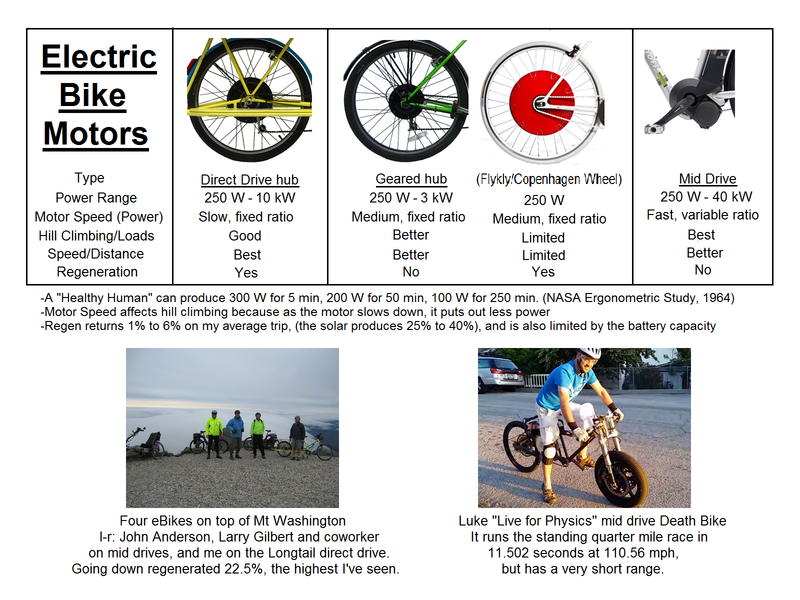 Justin Lemire-Elmore (eBike innovator) has also stated that 40 kph (24.9 mph) is a comfortable cruising speed. 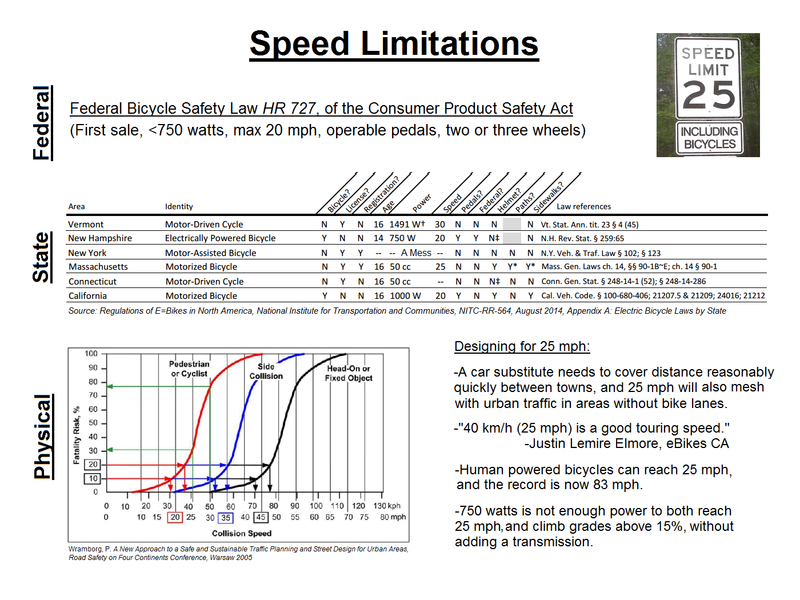 At the bottom is a typical graph of the physical limits I've also considered, the bike/ped curve is on the left in red. This is of fatality risk versus collision speed, and you can see that up to about 15 mph the human body survives well, (which makes sense because we can run that fast). Between 20 to 25 mph is a threshold where the risk starts to increase sharply, and I've set my design line just above that. This keeps the eBike speeds mostly within normal bike range for infrastructure compatibility, and combined with bike component strength limits, car driver expectations, the practical need to cover distance, and enough power for hill climbing, seems a reasonable limit. 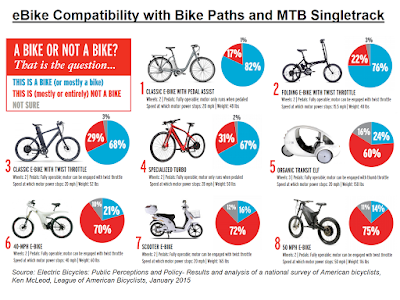 The League of American Bicyclists commissioned a survey to find out what most people think of eBikes. In some areas, such as residential communities with bike paths, or National Parks with mountain bike single track trails, the speed of an eBike has shown up as a conflict between different users. 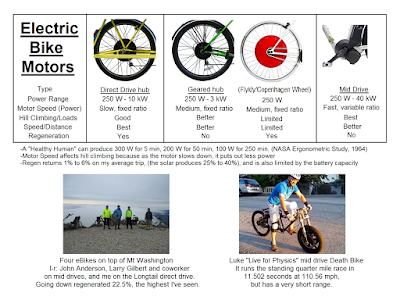 The first four bikes on this chart look normal and have lower power, and most people felt they were a bike. (As Luke "Live for Physics" has said, "If it looks like a bike and it acts like a bike, then it is a bike.") However starting with the large enclosed trike, and including a 40 mph and 50 mph bike (i.e. motor power only on level road), as well as the eScooter with minimally functioning pedals, most people felt they were not bicycles. These opinions fit well with most bicycle infrastructure goals, however there is an obvious problem with urban delivery bicycles and trikes. 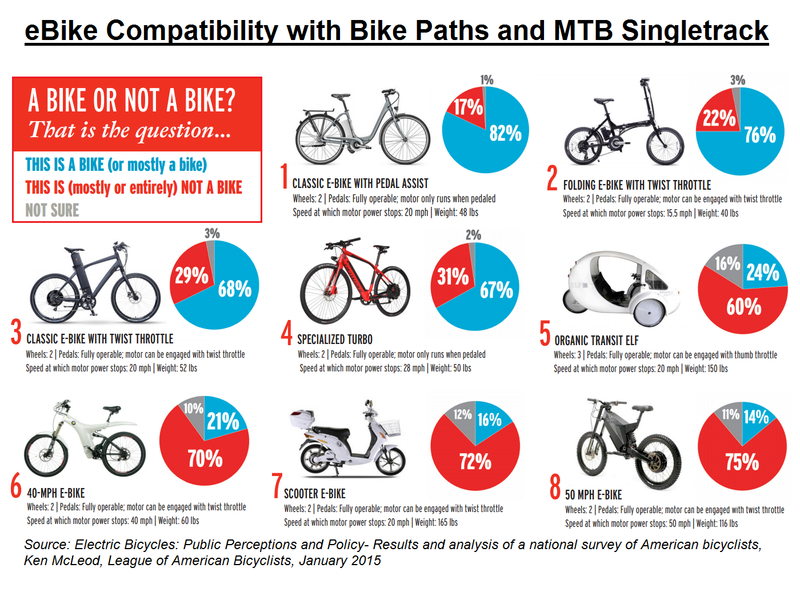 While there is a fairly vocal faction of bicycle purists that have been calling for eBikes to be banned from paths or MTB trails, this does not represent a larger group of people with physical impairments, for whom eBikes would make the path or trail accessible. 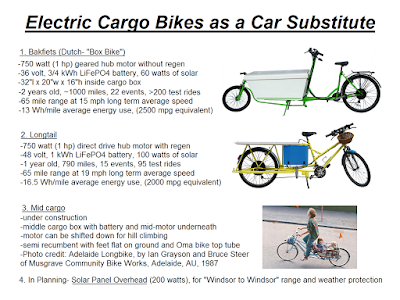 To sum up the benefits of an electric cargo bike, the main benefits would be better health, connection to the world around you, saving money, and much better for the environment than a car. The graph shown above is from a Drive Electric Vermont presentation by Dave Roberts, and illustrates the amount of energy used by different vehicles, bicycles are the tiny bar at the bottom. 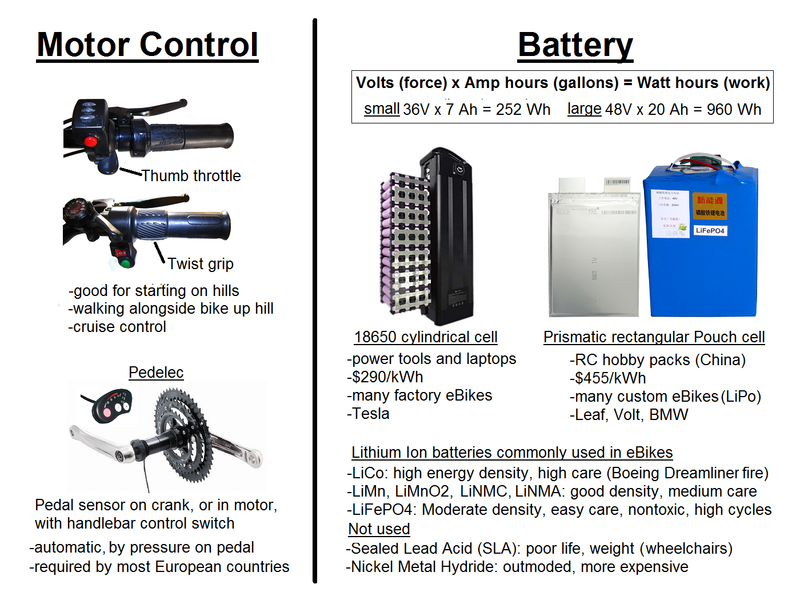 -If you have a small battery, don't pedal, and drive fast, it would be 250 Wh divided by 25 Wh/m, or 10 miles. -If you have a large battery and pedal along slowly, it would be 960 Wh divided by 10.5 Wh/m, or 90 miles. I know many people can not imagine biking in the winter, so I've added the pictures on the right. 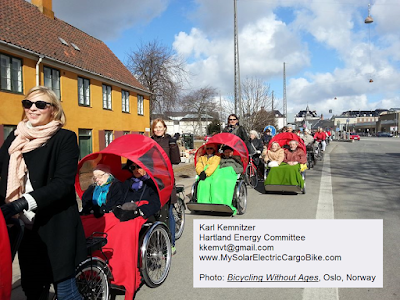 At the top is Eric Larsen riding around the Artic, next is a Bakfiets being used to haul ski boards around a ski area for classes, then another Bakfiets pulling the kids along a snow covered street, and at the bottom is Maria Leijerstam on her trike at the South Pole. Vermont has a very strong winter sports culture, and it is only a small step to include biking. 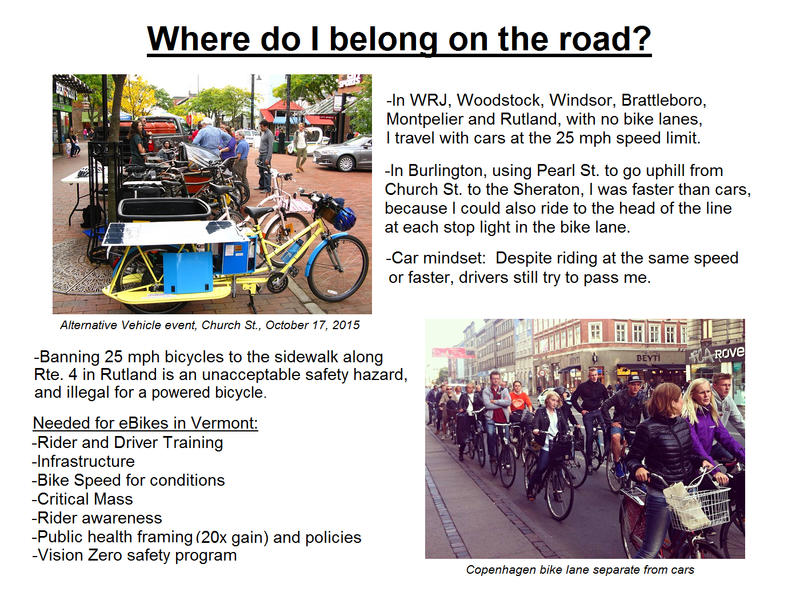 This last slide is from the Bicycling Without Ages program, which is in many cities around the world. This is from Oslo, Norway, a climate known more for cold than being tropical, but where biking is still common. If you look close at the four trikes that are carrying seniors, you can see battery packs under the rear racks and a motor in the rear wheel. (There are also perhaps 20 other bike riders following them.) Bicycles are very valid solution for many purposes, and the main problem we have with them here in the U.S. car culture is that we have forgotten how to use them. Electric bikes with better bike infrastructure are a serious car substitute.